If you’re looking for excellent gifts for men this holiday season, you’re in the right place! Thanks to the help of my husband, who gave insight into what guys really want, I came up with a list of the best Christmas gift ideas for men. 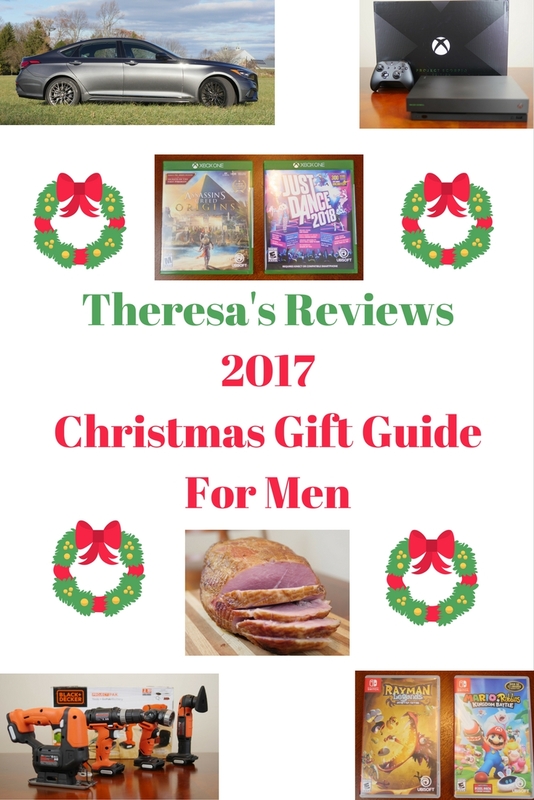 Featured in Theresa’s Reviews 2017 Christmas Gift Guide For Men, you can find gifts to fit any budget that include luxury items, the latest technology, fun games, and practical items. This year, Theresa’s Reviews 2017 Christmas Gift Guide For Men shares a variety of gifts to impress someone special. You can find something to fit every budget! One incredibly nice gift is a brand new car. 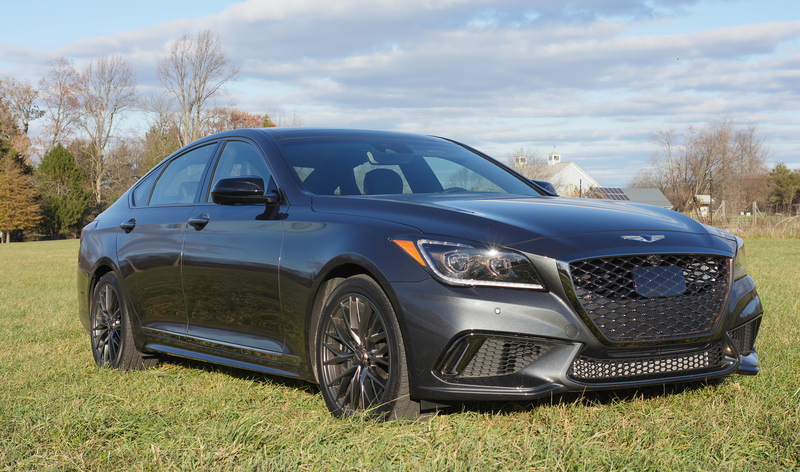 For this gift guide, I had the opportunity to try out the 2018 Genesis G80 Sport. This luxury car has leather, heated seats and copper accents. The dual automatic temperature control and power rear sunshades make long rides much more comfortable. It also has a multi-view camera and a 9.2″ touchscreen and DIS Navi with HD display. Not only does the car offer comfort and convenience, but it also has many safety features. If you are switching lanes, a light will come on to notify you if someone is in your blind spot. If traffic is stopping and you are too close to the car in front of you, it notifies you that you need to stop. The 2018 Genesis G80 Sport is an attractive vehicle that offers comfort and convenience. If you’re upgrading a vehicle for Christmas, the 2018 Genesis G80 Sport is a great pick. Also, it fits at least two car seats comfortably, while still having an attractive look. One of the technology biggest releases close to Christmas 2017 is the X Box One X Project Scorpio Edition. 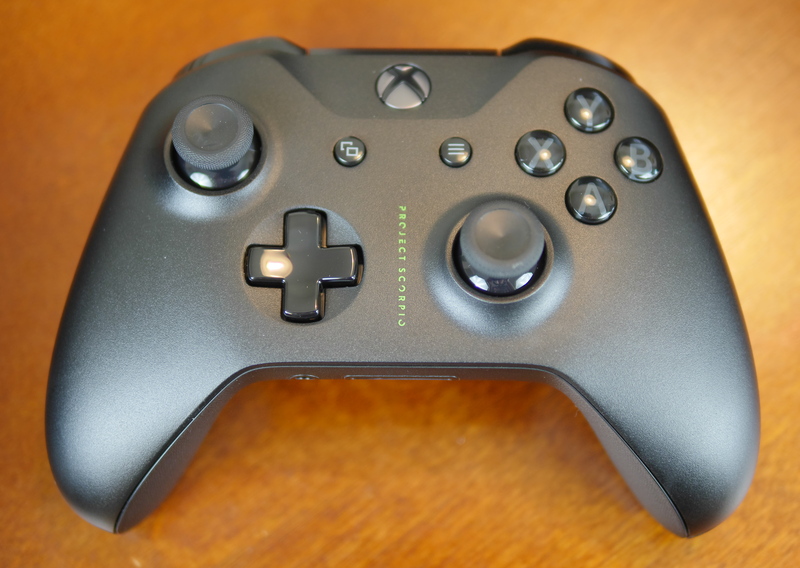 With the X Box One X, you can watch 4K videos and do 4K gaming. Paired with a 4K big screen television, this would be the ultimate gift for the entertainment room. We pre-ordered this at Game Stop, and we were very excited to get it in before Black Friday, just in time to upgrade our television so we could really appreciate the 4K quality. Technology gifts are fun because you have something to play with on Christmas day, but it can be expensive to keep up with new technology as it comes out. One of the best things about shopping at Game Stop is that you can also trade in old electronics to make the latest technology more affordable. You can trade in an old gaming system, old video games, and more to receive in store credit. The X Box One X Project Scorpio Edition is the latest in 4K video and gaming technology. 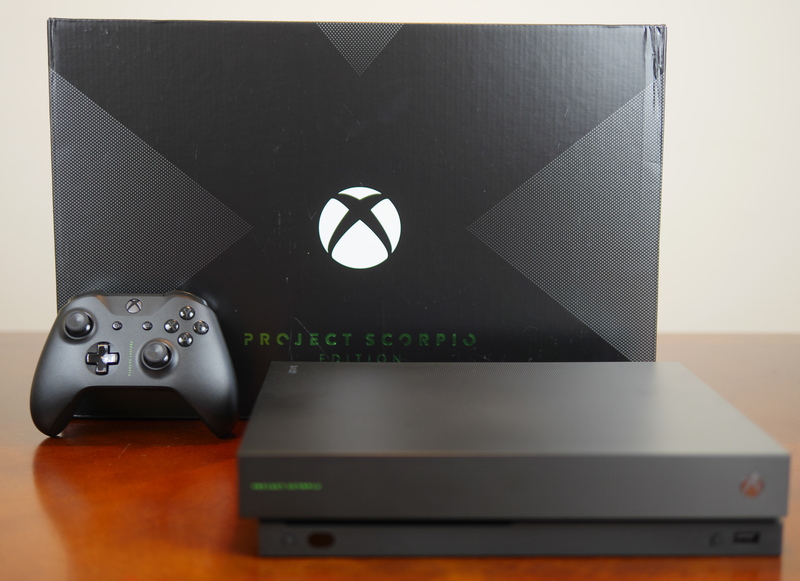 With the Scorpio Edition, you receive the Xbox One X Project Scorpio Edition 1TB Console, Project Scorpio Edition Wireless Controller, Xbox One X Vertical Stand, 1 month Game Pass subscription trial, 14-day Xbox Live Gold trial, an HDMI cable (4K capable), and an AC Power cable. Project Scorpio is a limited edition X Box One X. Game Stop did a great job of getting our X Box One X to us in time for the holidays! Something small to go with the new gaming system (or even if you don’t upgrade your system) would be new video games. Ubisoft has several new releases in time for the holidays! Assassin’s Creed Origins is the latest installment in the video game series that involves visually stunning time travel in historical locations. This one takes you back to Ancient Egypt. Another favorite release is Just Dance 2018, which offers more hit music that ever before. This can be a fun way to incorporate exercise and gaming into a family fun night at home. 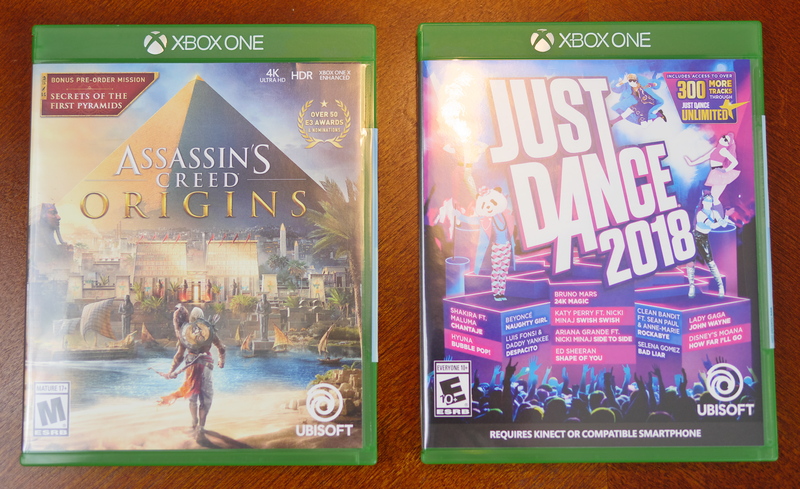 Some of the latest X Box games for 2018 include Assassin’s Creed Origins and Just Dance 2018. From Ubisoft also come some new releases for the Nintendo Switch, which is a gaming system you can take on the go. Rayman Legends Definitive Edition, the fifth title in the Rayman Legends series, offers imaginative scenarios and an excellent soundtrack. Bring back the fun and nostalgia of the Super Mario Bros. with Mario + Rabbids Kingdom Battle, which is exclusively on the Nintendo Switch. This adventure game combines four characters from the Mario franchise (Mario, Luigi, Princess Peach, and Yoshi) with four Rabbids as they adventure through different worlds. 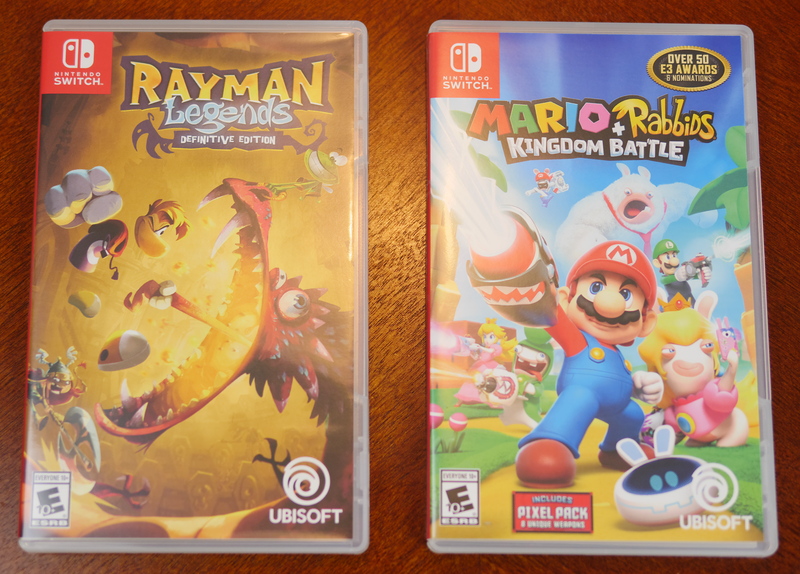 Some of the latest releases for the Nintendo Switch include Rayman Legends Definitive Edition and Mario + Rabbids Kingdom Battle. Next, Black and Decker has a newly released tool kit that makes an excellent holiday gift. The GoPak 4-Tool Combo Kit comes with four essential tools. You get a drill/driver, jig saw, sander, and LED flashlight. The Black and Decker GoPak 4-Tool Combo Kit has a drill/driver, jig saw, sander, and LED flashlight. This is a nice set of basic tools for all of your basic woodworking necessities, especially for small projects. It’s a nice all-in-one starter kit if someone doesn’t own all of these tools already. 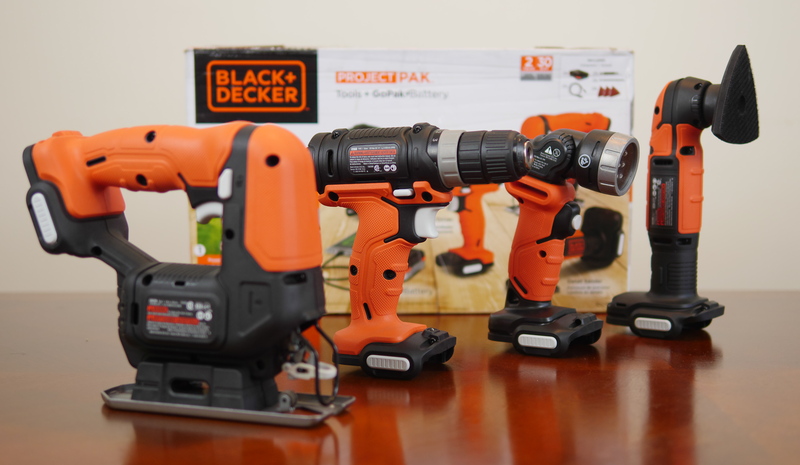 With the The Black and Decker GoPak 4-Tool Combo Kit, you get everything you need for basic woodworking projects. From Allen Brothers, you can now order the finest Mangalitsa Smoked Holiday Ham. Often compared to Japanese Kobe, the Mangalitsa ham has flavorful fat that makes this one of the most delicious cuts of meat. 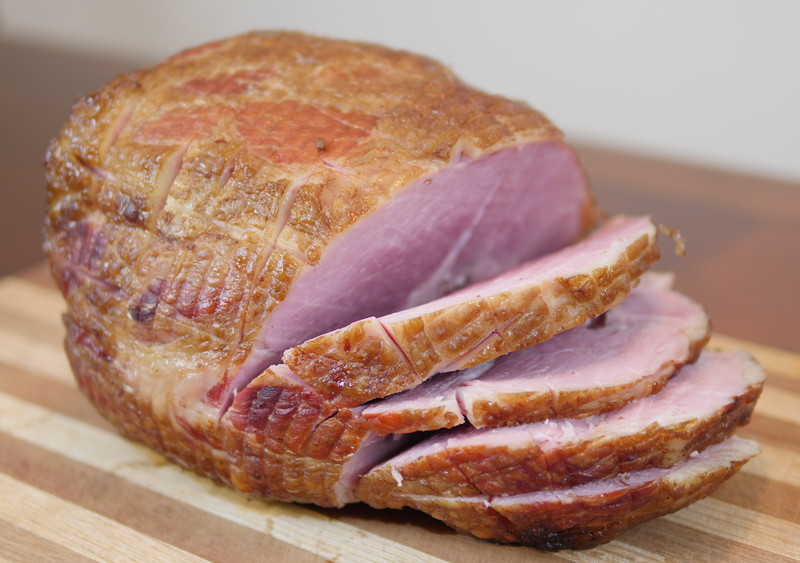 This is one of the best hams I’ve had, and it was simple to prepare. The ham is easy to slice and comes with everything you need to serve it. We enjoyed eating this for Thanksgiving, and it would be a wonderful choice for a holiday meal. The whole family can enjoy the delicious flavors. Allen Brothers Mangalitsa Smoked Holiday Ham is made from 100% Pure Bred American Mangalitsa. 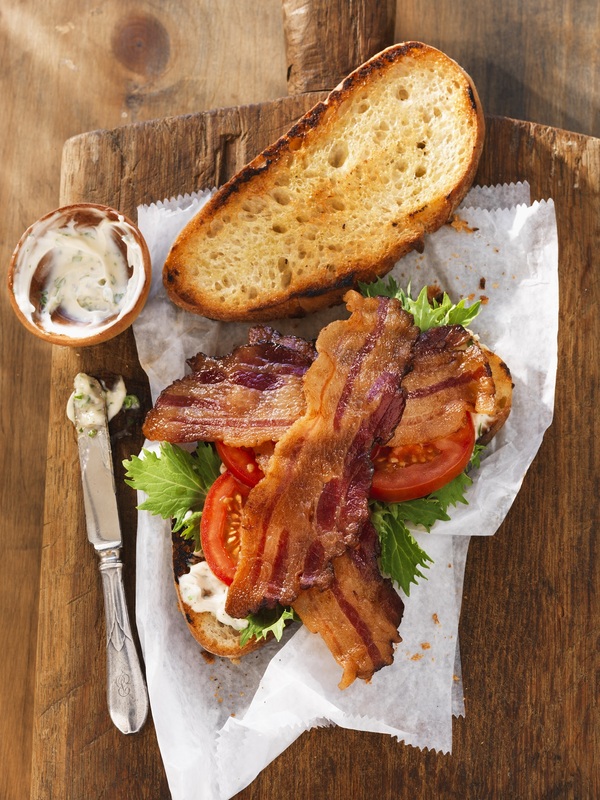 Another new product from Allen Brothers is the Hickory Smoked Mangalitsa Bacon. With a deep, sweet tasting flavor, it is rich is good monounsaturated fats and high in Omega fatty acids. We enjoyed eating it alone with eggs for breakfast or on top of a burger. You could add it to a Christmas breakfast or brunch for a fantastic, smooth flavor. This year, Theresa’s Reviews 2017 Christmas Gift Guide For Men shares the gifts that men really want. From cars to technology and some practical items too, you can find something to fit every guy’s wishes and your budget. What are your favorite gift ideas for men? Share in the comments! Pin the image below to come back to the article another time. For more holiday gift ideas, check out Gift Guides, and follow Theresa’s Reviews on Facebook, Twitter, Instagram, Pinterest, and Youtube! black and decker would be amazing! Lots of great gift ideas here! I think my husband would love the X Box One and my son would love the Mario game! I love the car and of course the video game…but I have to say my hubby he loves a good ham! These are all great! Especially the car and the XBox. My husband would be excited to receive any of these! I was just thinking the other day, there are not enough gift guides for men and they are the hardest to buy for! I think my husband would freak out if I chose a car for him. He will be really happy with the game console. You have some great gift suggestions! Hi Theresa, the B&D tool set is a great idea. I know I’d be happy if someone gifted me that!